This time of the year, there's normally not much colour. 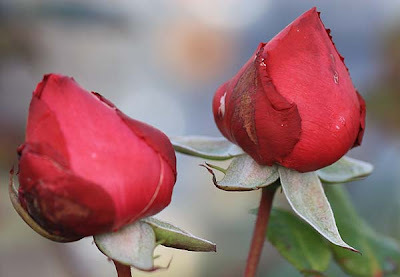 Surprisingly, we have some roses at the entrance, but they won't be blooming. 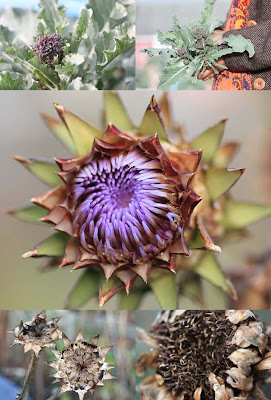 The cardoon heads have died down too, but they still look architectural and magnificent. (Above) I picked a few heads of purple sprouting broccoli (PSB) but I think they may be a bit tough to eat. I'll find out in time. So this is the state of the flying greenhouse since we last saw it. It is mangled. Part of the roof is missing and if you look through the door the back is also missing and buckled. A job for next year. The strength of the wind even managed to bend my Brussels sprouts. (From top left clockwise) Looks like we might have some parsnips for our Christmas dinner, but I will pull them out a couple of days before Christmas, just in case they are too oddly shaped and therefore not worthy of the 'Christmas plate'. 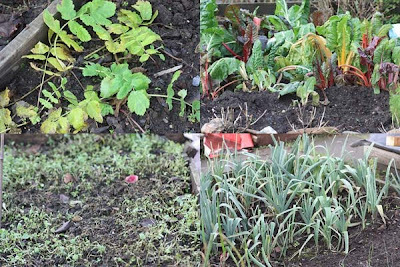 The chard that I had moved from one bed to another has not done well, so that they were all together rather than dotted here and there are really looking limpy. So anyone thinking of doing this next year, I would recommend not too. The fenugreek (bottom left) has done its work as green manure and is now dying back and feeding the ground. The leeks are looking good too. 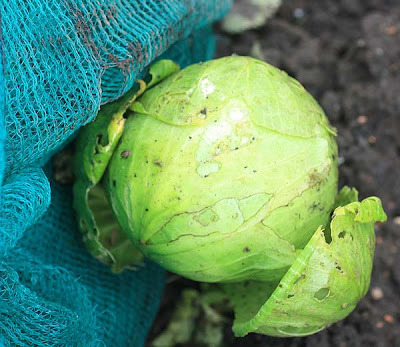 The last of the cabbage. The slugs and snails seem to be feasting on it, that is what you get with organic growing, plus its the wet weather. This is my nine star perennial white broccoli. The leaves are growing thick and lush, but no signs of broccoli heads yet. Its the first time I have grown these, so I am looking forward to seeing what they look like and how they taste. Something still to look forward to if the PSB doesn't have a second burst of life. 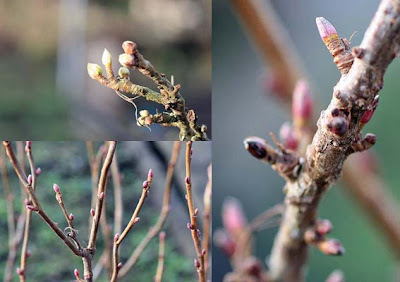 Here are some close up shots of my berry bushes: red currants, black currants and a gooseberry buds. Poor old cabbage. but the berries look very promising. 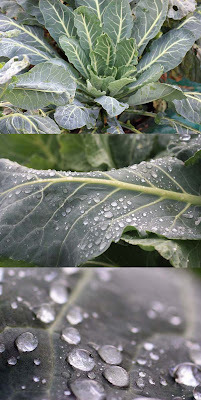 We had a perennial broccoli, it never produced much but what it did was delicious. Love the flower pictures but felt your pain with the greenhouse, that's going to be quite a job to fix. Oh that greenhouse does looked like it was in fight and lost! 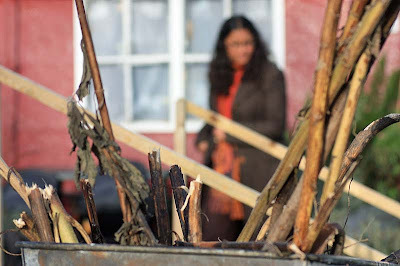 If its beyond repair it looks like you might get enough pieces to create a coldframe. Thank Louise - the berries do look promising. Your right Nic, He is - how else would I have appeared in front of the camera. Welcome Arch and Thank you for your kind comments, the one about my blog 'nom de plume'. I am excited now and looking forward to the perennial broccoli growing. I know where to go if I have more questions about it. Yes, everytime I look at the greenhouse, picture or for real - my little heart sinks. Yes, it is pretty much in pieces. May have to rebuild one from scratch and salvage the pieces for other projects. 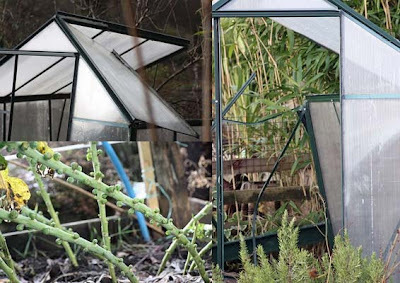 I've been rather out of it recently, so rather a surprise to see your greenhouse in such a state - what a ......! Take it you had some rather rough winds. So sorry. Luckily, it is rarely all bad news in a garden as some of your other photos show. Thanks for coming by Choclette.